When TBC is used with video mixer, its capability of synchronizing two video sources enables video mixer to mix two videos on the same screen. With this feature, special effects such as cross-fade and cross-wipe can therefore be achieved. TBC can also be used to correct the time-base error of a VCR. Any VCR associated video must have its timing error corrected by TBC before it is used for broadcasting or video production. TBC is also used in CATV headend system for program scrambling, which requires input video to be very accurate in H-sync timing. The use of TBC will ensure input video's accuracy on sync. timing so that the scrambling device can add encoding signal precisely onto input video's horizontal blanking region. A true multisystem Time Base Corrector automatically handles video input of any systems-NTSC 3.58, NTSC 4.43, PAL, PAL M, PAL N, SECAM. Picture adjustment on contrast, Brightness, Color, Tint and Horizontal/Vertical phase. Digital comb filter for input Y/C separation offers best output quality. 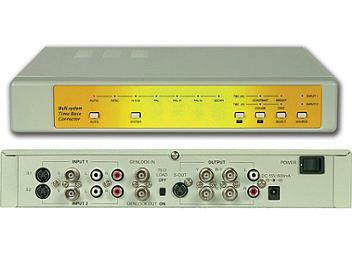 Built-in automatic gain control (AGC) ensures 1 Vp-p output signal (input level ranges from 0.5 Vp-p to 2 Vp-p). Automatically sending out a color bar pattern when there is no video signal presents on the input.